What is the best option in a tilt table for use with patients that are recovering from long term bed rest? Tilt tables are often used with patients that are recovering from long term illnesses when they have been immobile for long periods of time. The table can be used to allow them to become acclimated to an upright position without concerns with rapid changes in blood pressure that may cause dizziness and possible risks of falls. Since these tables can also be used to correctly position a patient for different types of examinations and tests, especially with patients that have limited or no ability to stand in an upright position they can be invaluable in all types of health care facilities. When selecting a table for this purpose it is important to have a solidly constructed table that is padded, has adequate, wide straps for security, safety and comfort and that also has a foot board that is wide enough to comfortably support the patient. 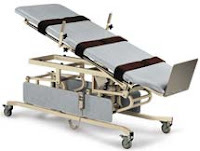 The option of locking casters on the table is also an important feature since the table can be secured in place to prevent any movement that may be anxiety provoking to the patient. The table can also be moved from patient room to room as needed to allow therapy in the room rather than requiring the patient to come to a treatment or therapy area, at least initially. What options are available in tilt tables and can all patients use the same type and style of tilt table? Since many patients using a tilt table will be non-ambulatory or regaining movement after long periods of bed rest a hi low option can be invaluable. This allows patients that are in wheelchairs to easily access the table in the horizontal position from the chair with the table top lowered to easy transfer level. Once the patient is secured on the table in the horizontal position the table can be raised and then tilted, keeping the patient calm, secure and safe through the entire process. Most tables are designed for standard sized adult patients and can safely tilt and support patients of up to 325 pounds. Bariatric patients cannot use these tables and instead require a bariatric table. 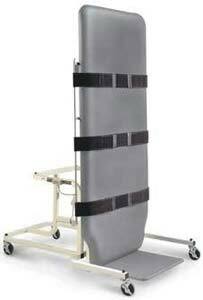 A bariatric table can safely support patients up to 500 pounds. These types of tables are typically motorized for smooth, continuous positioning. Are all tilt tables manual crank or what other options are available? What are the pros and cons of each? Tilt tables can be either manual crank or positioned by electric motors. Both options are equally good and really it is a personal preference choice. Manual crank tables tend to be less expensive than electrical options and, because they don't have an electrical requirement for operation, they may be more versatile in a wider number of settings. Electric tables will require the use of a hospital grade plug in, which may not be available in all environments.